So it's inevitably become the time to pivot. It was smooth sailing with my idea for too long, so something was bound to go wrong. I have to pivot my process in order to preserve my concept. As it turns out, the all-powerful OpenSecrets API gives no wiggle room for manipulating the data provided with their calls. Looking back, this makes a lot of sense as I look at all the precedence I have that have made mashup websites with OpenSecrets and I wondered why all of their data is in the same ugly, boring format. The API doesn't allow for that to change. For this reason, I have decided not to use the API. This may seem like a rash decision, but the truth is I think that using it would completely go against my concept statement. My goal here is to create a website that presents the data in a better way than OpenSecrets does. In a way that creates actual traction for the upcoming elections with millennials. If I do use the API, I am just another one of the many mashups that already exist and don't make enough of an impact. Instead, I will be manipulating the bulk data. 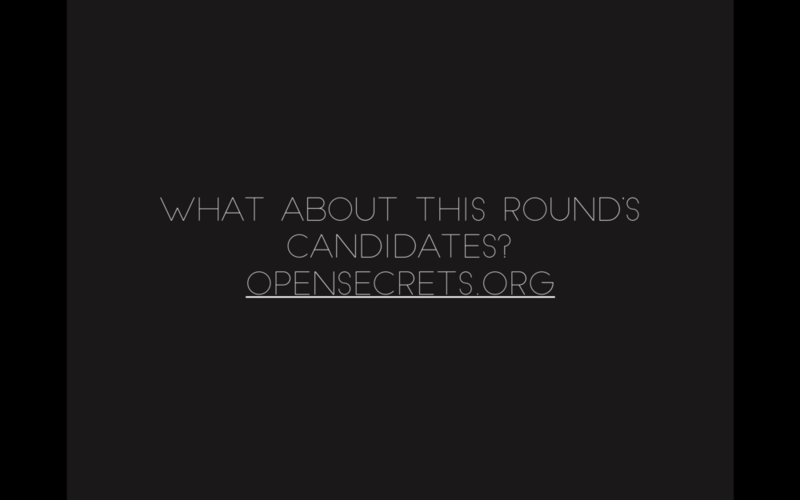 The issue here is that OpenSecrets does not have up-to-date bulk data downloads for the 2016 candidates or ANY bulk data download option for all the organizations. Huge problem. Therefore, I have to manually grab that information from the website. I am cutting out an immense amount of the information currently shown in organization profile pages and only include the amount of money given to each political party plus the bills each company has lobbied for in 2014. I think some of those bills are incredibly fascinating to discover. So, what does this mean? Clearly I can no longer have a full 200,000 organization search with beautiful and accurate profile pages for each. I have started including the data manually in the top 50 brands where Millennials spend the most money. What I've realized is that this is actually a gigantic undertaking that requires the years and years of work that OpenSecrets itself put into it's website, to basically create my own, more simplified version. I think for the purposes of this final and getting the website published soon, I can just finish the profiles for all the candidates and the top 50 brands, implement parse with the blacklisted button, and leave a note explaining to users that this project is a work in progress. I will be keeping the google custom search at the bottom of every page which only searches OpenSecrets and LittleSis for those looking for other brands or more information. What I still need to work on: finding a way to make my tables fit in better with my current web design, implementing Parse. I am creating a web and iOS app for American millennial voters/consumers in charge of their own finances (approximately ages 23-34) to become more knowledgable about where they spend their money, and evoke feelings of responsibility and empowerment and thoughts about how they can bring about change in today's world by wielding their monetary influence in the context of the upcoming 2016 Presidential Elections. Where do they encounter it? When do they experience it? In the time when people are thinking about upcoming Presidential elections, when they are taking into consideration their ability to bring about change. This country is capitalist, and therefore it in a way runs on consumer behavior. People have many different opinions, but if enough people are informed about a specific topic and want to bring about change, the power to bring it is in the numbers. What are they doing while experiencing it? What does the project ask of its audience? How are you going to take control of how this country is run? What do you want the audience to take away from their experience? I want them to feel like they've learned a great deal about where there money is going and incite a need to take action in the form of how they consume. 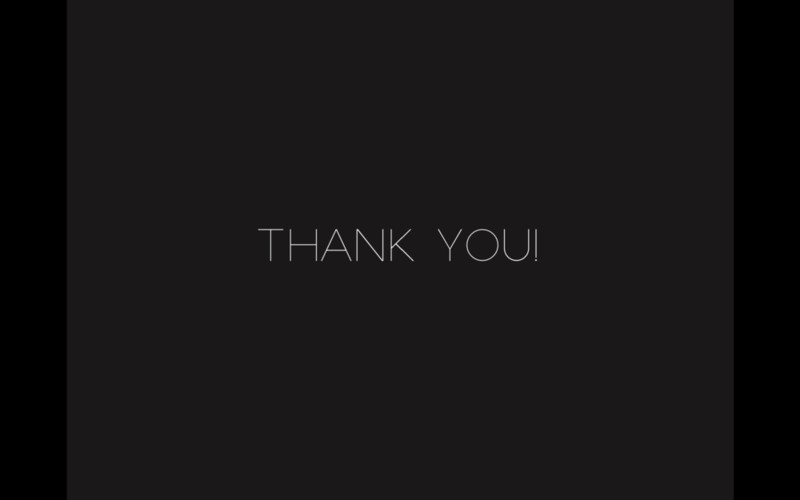 What are some adjectives around how the project will make its audience feel? OpenSecrets: CRP is a research group that tracks money in US politics and its effect on elections and public policy. They advocate for a more transparent and responsive government. OpenSecrets is their website. LittleSis is a website that keep tabs on different media sources to connect the dots about the connections between the world's most powerful people and organizations. Citizens United is dedicated to restoring the government into the citizens' control through a combination of education, advocacy, and grass roots organization. I am also trying to restore control of the government to the people, and specifically showing millennials how powerful their actions can truly be. Dollocracy: CRP is a research group that tracks money in US politics and its effect on elections and public policy. They advocate for a more transparent and responsive government. Dollocracy is their mobile app. It is basically the OpenSecrets website on a phone, with terrible usability. BuyPartisan is a mobile application available on the iPhone which allows you to scan the label of any item and see the political leanings of it's parent company. While this is a great and convenient user experience, the app unfortunately crashes often. Greenhouse is a free browser extension that uses information from OpenSecrets to give you information on legislators and the role money plays in Congress. It displays information on any browser when you click on a legislator's name. 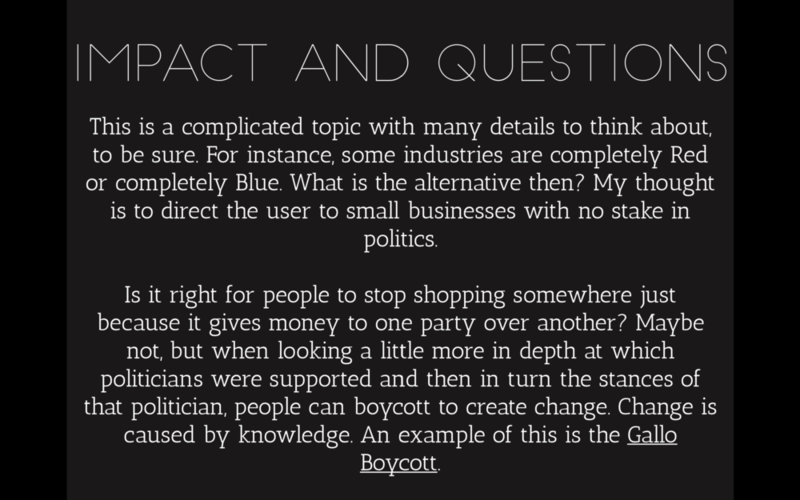 I'm using the Gallo boycott as a precedent for an event showing the power of boycotting. 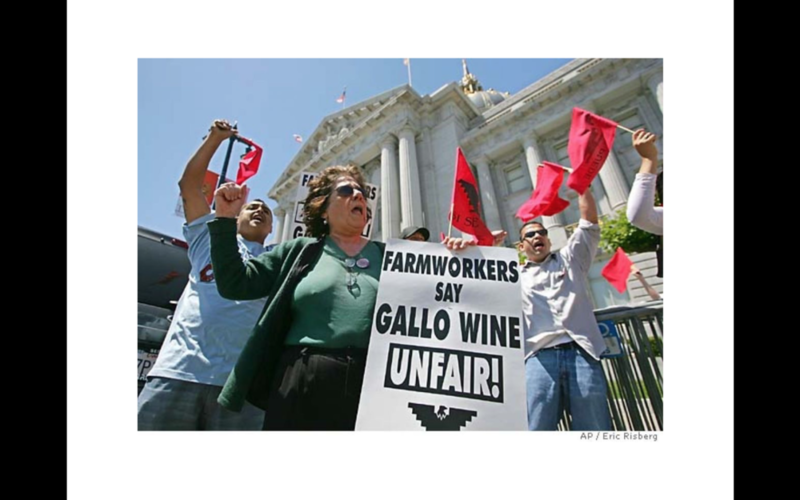 Farm workers boycotted Gallo wines in 2005 and in the past as well saying that the company exploits and mistreats their workers. American millennial voters/consumers in charge of their own finances (approximately ages 23-34) in the context of the upcoming elections. Digital means were used because research has shown that is the best way to influence this age group. In terms of research, I studied extensively on millennials and their importance to brands, corporations, and the political system. I also studied a lot about different existing organizations that are working to teach people about the government and how powerful people are connected to each other. I studied each of the candidates for this year's election very closely as well. I learned about PACs and Super PACs and plan on explaining all of this information to users in a 'learn the basics' section of both my web and mobile apps. In terms of design, I am creating something minimal with better a better interface than of those that currently exist within this domain. I plan to attempt to target important information without being too wordy and present that information in an easy to understand and visually appealing way. I also plan on creating more interactivity and ability to take action by adding the blacklist button and the recommended options. How can American millennial voters/consumers who are in charge of their own finances (ages 23-34) gain a greater interest in making informed decisions about where they spend their money? Questions I've answered with this prototype: Who are the candidates? What are their stances? 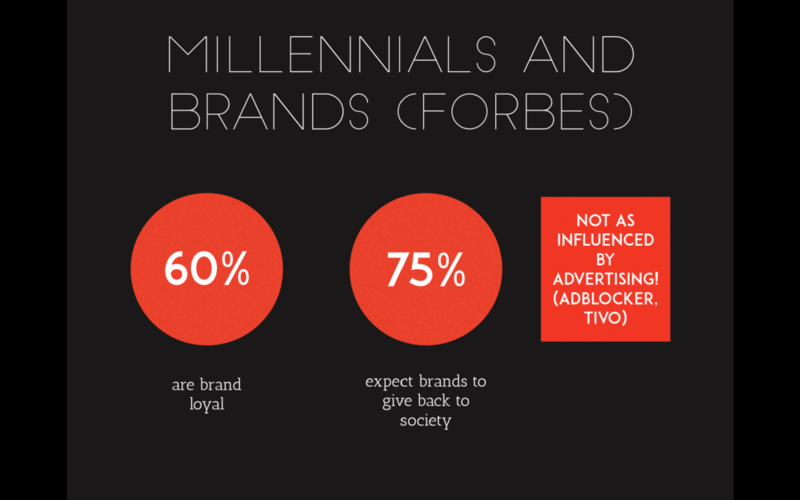 What companies do millennials give most of their money to? 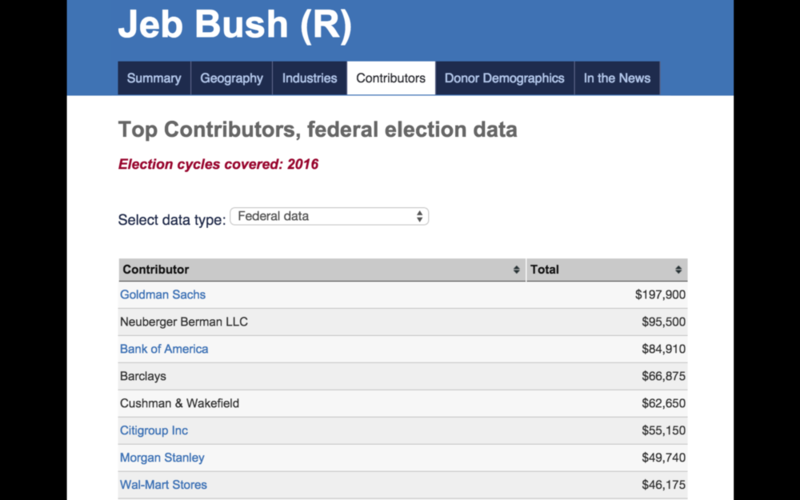 Who are the top contributors to each candidate? Prototype 2: Get the search brands to work using the OpenSecrets API (getOrgs call), see alternative companies at the bottom of each profile page from the getInds call which keeps information about organizations in each industry. I keep this blog in order to have a record of all of my concepts, proposals, domain research, bibliographies and prototypes.